Sign up together with a friend you each save $250, sign up with two friends and you each save $300. Due to popular demand we are offering another option for this event. Option B in which you receive fabulous training from Carole Grace & Daniel McDermott, but does not include the trips, lunches or dinners. Cost $1000.00, bring a friend or friends and save 100.00 each. Space is very limited. Get the training and experiential knowledge on this vortex adventure to make real change in not only your abilities, but your life. If you’re employing intuition in your practice or you would like to, and are down for traveling to the one of the few spots in the world renowned for prompting inner change, and ready to make a difference – then join Carole Grace and Daniel McDermott for this Transformational Intuition Vortex! We will help you shift your mind, body and spirit to a new level of intuition to incorporate into your daily life, to be in alignment with yourself and others. Simple, this is the PERFECT environment to heighten your intuitive abilities and learn to tap in daily and to make better decisions, because better decisions equals a better life! To learn ways that your intuition is talking to you, so you can stop kicking yourself for not listening! There’s no need to do this alone, worried about whether you’re doing things the right way or not – or whether you’re going to be able to develop the gifts you were born with and are destined to manifest! Carole and Daniel will be using their gifts of Intuition, Huna, and Hypnosis to help you attain new levels of awareness. You know you have got what it takes, you just need some expert help in aligning your mind, body and spirit to attain that level of knowing. Daniel McDermott is an expert certified hypnotherapist, NLP practitioner, and Huna practitioner. Carole Grace is a international renowned Psychic Medium, Healing Touch Certified Practitioner, Reiki Master, Meditation Instructor. The “Summon Your Intuitive Power In Mystical Sedona” is JUST what you’ve been looking for to get the help you need to make it happen! Plus, we’ll be exploring the world famous Sedona vortexes as well as the fabulous city of Sedona, known as a spiritual center, a world famous beauty landmark, and all forms of local healing arts to avail yourself to! 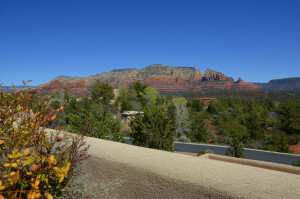 Sedona Creative Life Center Set amid the mountainous red rocks, the Center is a haven for spiritual retreats for seekers worldwide. 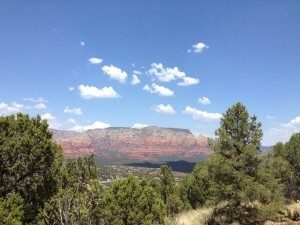 We’ll start at the center and each day go out to new fabulous locations in Sedona. 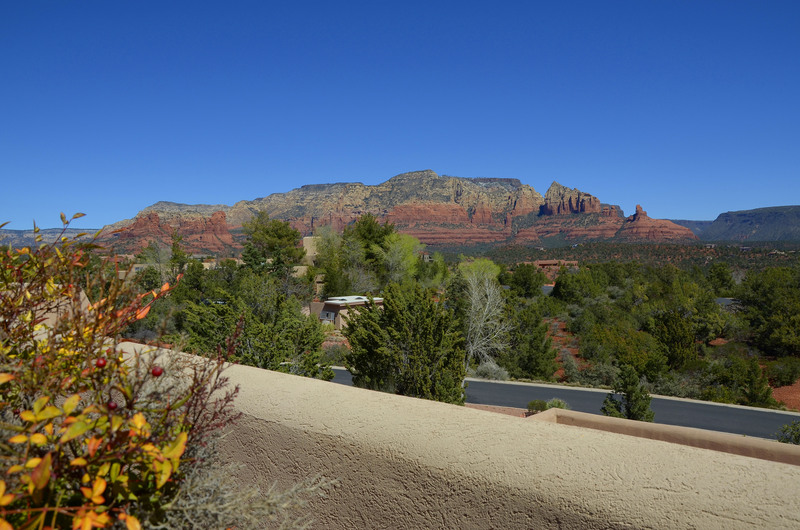 Not only will you enhance your abilities in profound ways, but you’ll find out why USA Today listed Sedona as the #1 most beautiful place in the country. 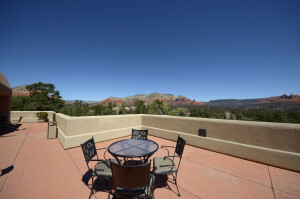 You’ll immediately see the beauty that surrounds and envelopes Sedona when you arrive at this world acclaimed location. Experience the world famous energy vortexes! Here, you sense something sacred is already happening, and the more you experience it, the more you will know the energy and shift is genuine and real. Those who feel an attraction to using their intuition for the benefit of others and for themselves. Those who are just looking for the “right push” to take them to a new level of ability. Those who are looking for tools to use in everyday life. The trust and confidence in you and your intuition! Pizza dinner and wine on the veranda while looking at the beautiful red rocks at sunset. You’ll have time to go off on your own as well and also to rest and integrate all the training. We’ll go to Airport Lookout Vortex and see the breathtaking panoramic views that drew Hollywood to this desert to make movies. You can reserve your space for the early bird with a $500 deposit and the balance is due by November 1st 2015. After November 1st the price is $1888.00, and 50% is due to hold your spot. Space is limited to ensure that adequate attention to each student is given and due to the intimate nature of the course. No refunds after December 27th, 2015. We reserve the right to cancel the trip if it is not meeting the minimum attendance required (your deposit is totally refundable). Trip cancellation insurance is always recommended when making travel plans. The Mediumship class was absolutely amazing. It helped grow the confidence in my abilities and now allows me to push insecurities out and listen to what is being said. I would definitely recommend this class to anyone that is looking to delve deeper into their abilities but is having a hard time trusting themselves. I would like to share with you my experience, as a first time student, with Carole Grace. I took her Medium Intensive class recently and experienced firsthand her talents, gifts and giving manor to teach. Thank you Carole, I am looking forward to my next classes! When the student is ready, the teacher appears. When we are born, we are all provided with a full set of spiritual gifts. We are then offered opportunities to select and grow our gifts according to our own personal and unique design. Although I knew little about what a Medium does; it was one of those gifts of which I desired to develop. I heard about the class offering with Carole, from a friend who encouraged me to pursue growing my gifts. I was excited to meet such talented ladies on the same spiritual journey, we immediately became friends. Grace for guidance. Carole in her gentle calming manor led us through the activities to recognize and connect with our spiritual guides and Spirit. As I entered the room for class, I knew I belonged there and it was my time. Through Carole and the team’s encouragement within a safe focused setting, we were all able to raise our vibration and consistently communicate with Spirit. As we grow up, many times we become desensitized by mundane reality, forgetting how close the presence of spirits which are around us every day. Practice makes perfect. We received intense practice immediately and throughout the 2 days by performing readings with each other. This allowed me to confirm the authenticity of my spirit connection. I am looking forward to the monthly meetings where our new team of students can continue to exercise and grow. Be still to see, hear, feel, touch and then speak. Heightened sense awareness was also exercised, allowing us to experience and understand the variation of messaging from Spirit through our emotion, mental and spiritual signals; even more how they work together in communication. Humbled amazement was my experience. We all carry a calling to serve in different capacities. When our current worldly times involve sickness and change of great magnitude levels; we are called upon to grow and exercise our gifts in order to teach and heal others, our world and ourselves. I am very thankful to Carole and to Spirit for the guidance I have received. If you are still searching for a perfect gift, you can buy an hour reading for $125.00. 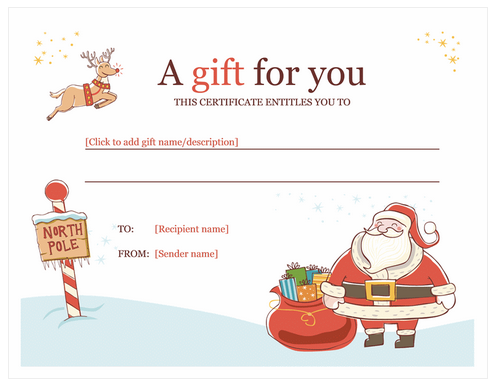 Gift certificates starting at $25.00 which can be applied towards any service such as a reading or energy treatment, class and the only exception is a fundraiser. Purchase an hour reading for $125.00, or a half hour energy healing treatment to help relieve stress and half hour reading for $130.00 expires 5/2014. Also upcoming (5/31-6/1/13) Psychic Development 2 day intensive workshop for $225.00 Visit the scheduling page to book now! 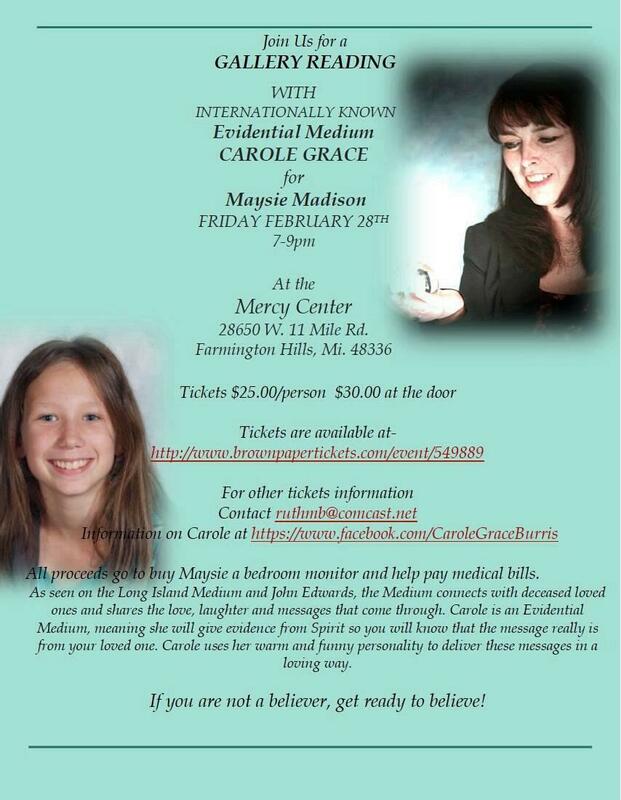 For those attending the fundraiser in Farmington on February 28th, 2014 at 7 p.m.for Maysie Madison you will receive $25.00 off a personal hour reading with Carole Grace. Please use the button below for more information and to purchase your tickets for this very special event! Also, prayers for this sweet little girl and her family are very welcome. 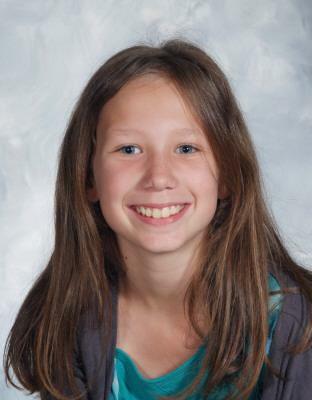 On March 7, 2013, Maysie Madison was put into a medically induced coma because of continuous seizures causing damage to her brain. The doctors have tried many things but are unfortunately perplexed. They made the difficult decision to remove the right side of her brain hoping that this would stop her seizures and she could recover with therapy. The devastating news came after the surgery that the seizures were continuing and were now affecting the left side of her brain; they had to put her back into a coma. The doctors are continuing their efforts but we can also help by raising awareness. For those who like my Facebook you are entered at chances to win a free reading or other random offers as well as enlightenment and fun. For those who like my page Facebook page you can get an hour reading For the price of $125.00 the week of 12-19th of August You can purchase up to 3 readings and use them all for you or give them away to family and friends. You will be giving and receiving readings on the first day.